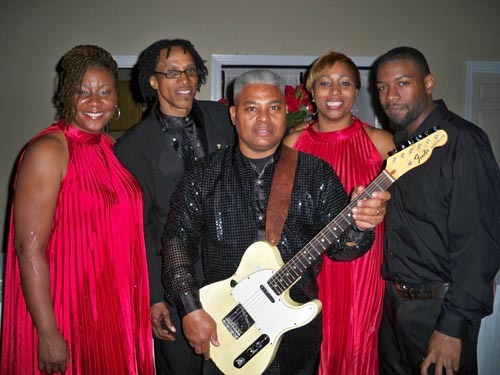 The Hollywood Band was formed in January with the intent of being mainly a private occasions band, specializing in R&B, Beach, and Dance music. Although the lineup has changed since the beginning, the group is anchored by keyboardist / manager, Harold "Hollywood" McColumn and bassist / producer, Michael Burnette. Joining them are female vocalist, Cathy Causey and drummer, Anderson Fraley. The Hollywood Band is a full-time unit with a total of over 40 years experience between McColumn and Burnette. The group is influenced by artists such as Earth, Wind & Fire, Kool & The Gang, Whitney Houston and many others. Causey, Burnette, and McColumn share the lead and background vocal duties. The band does a variety of songs that are suitable for whatever your event requires. The band carries their own sound and lights, and uses a mixture of sequenced and manually performed songs. The Hollywood Band has played dates in markets such as Lexington, Kentucky; Chattanooga, Tennessee; Tallahassee, Florida; Atlanta, Georgia, etc. The group is based out of Macon, Georgia (home of the Georgia Music Hall of Fame). Hollywood Band was awesome as before. Thanks for reaching out to me for feedback.